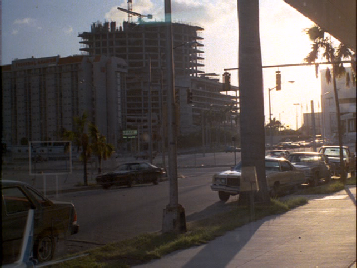 The episode starts with Crockett and Tubbs on a stakeout surveilling a couple in a nearby high-rise condo. 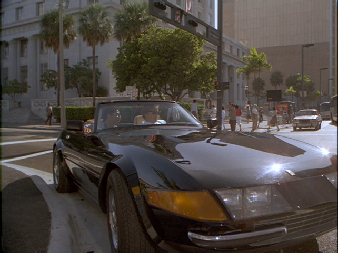 This scene is another example of why Miami Vice was ahead of its time. Most T.V. 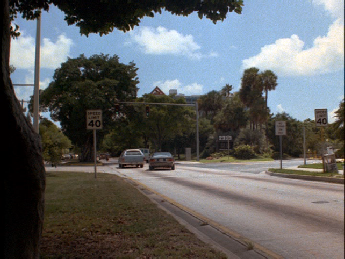 shows and movies of the time show an unrealistic surveillance where the cops are always at the window with a spotting scope sticking out the window, easily seen. 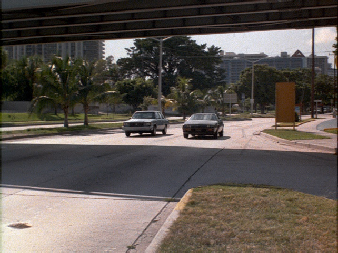 Miami Vice was the first show to use real techniques that made the show a whole lot better. Tubbs has his spotting scope set up a good 6 feet into the room from the window so he is a lot less likely to be seen. 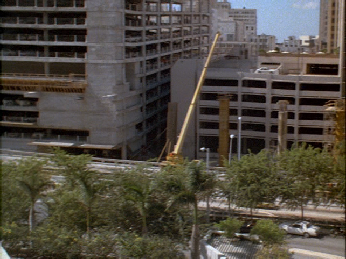 This scene was filmed on Brickell Ave. in Miami. 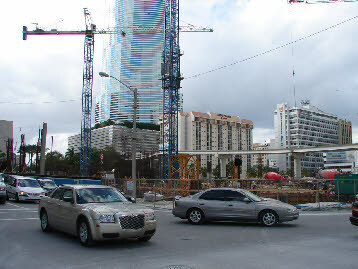 The building they are looking at is the now famous Atlantis located at 2025 Brickell. 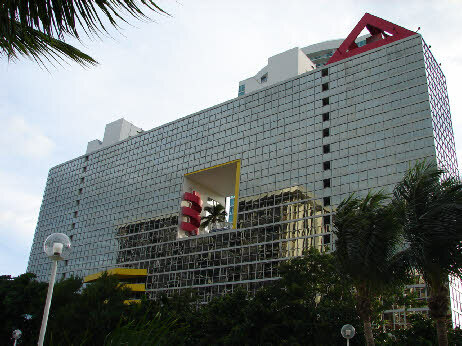 It appears in the opening montages and is very distinctive with the large square pass thru in the center of the building that has the bright red circular stairs, palm trees, and a swimming pool in it. 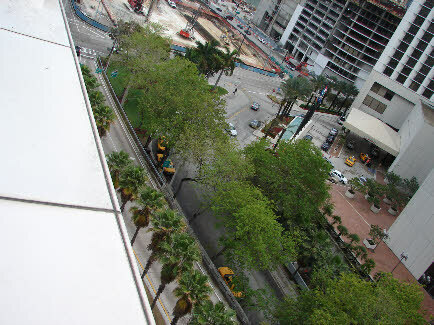 Our guys are watching from 1925 Brickell, approx. 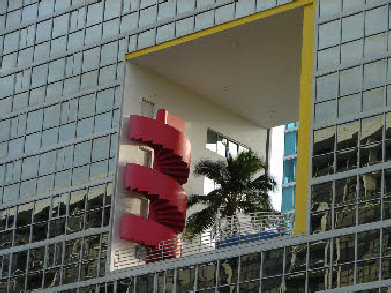 5 stories from the top. 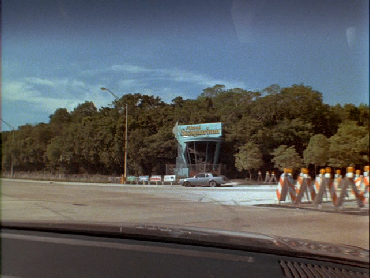 The opening montage is the same as that of episodes 2 + 3. 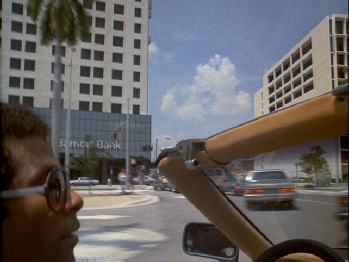 After the teaser we see Crockett and Tubbs driving by the Dade County Courthouse. We first see them northbound by the V.I.P. 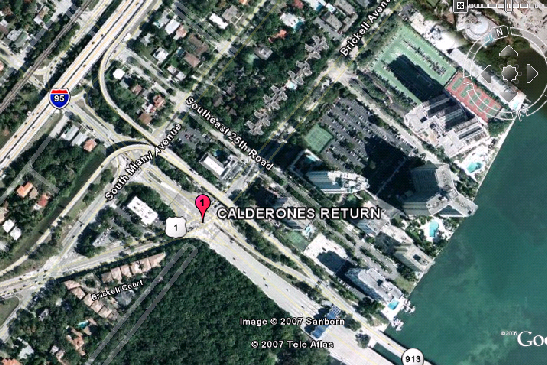 Restaurant on NW Miami Ct. Special thanks to airtommy at miamiviceonline for getting this driving scene accurately figured out. 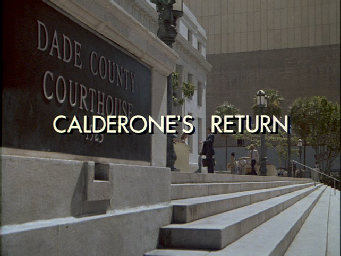 After their failed divorce at the court house, the scene cuts back to the Atlantis. 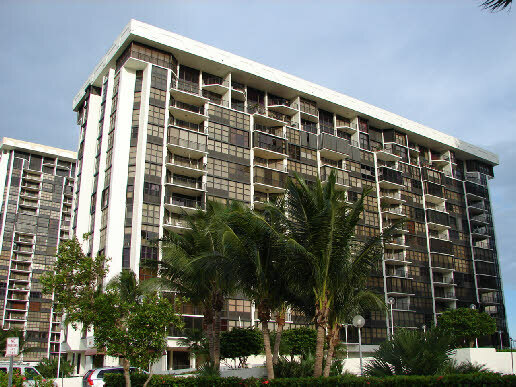 Fans of the re-make of the movie Scarface (1983) with Al Pacino will remember the Atlantis as seen here as the exterior (but not the interior) of Frank’s residence. 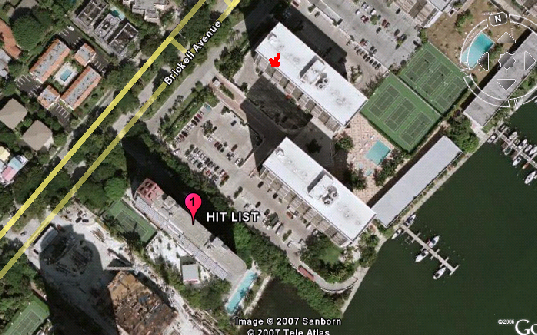 The hit is on. 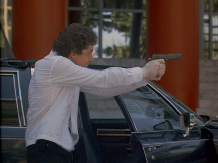 As the limo driver/hit man walks around the limo and reaches inside to put on the gloves, he makes a stupid mistake. He is putting on gloves so no fingerprints are left behind but to get the gloves he reaches in as seen below and with bare hands picks up the stock of the Franchi Spas 12 shotgun. This is the folding stock variant with 8 shot tubular magazine that was fairly new at that time. Gloves may now be useless since his fingerprints are already on the shotgun, unless they get smudged. The hit-man was the legendary Jim Zubiena. 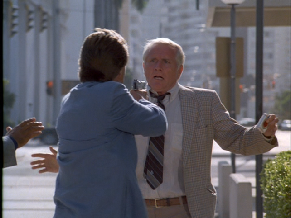 The technique he uses to draw and double tap the personal security man was called the Mozambique, and after airing on Miami Vice gained Jim a great deal of fame. 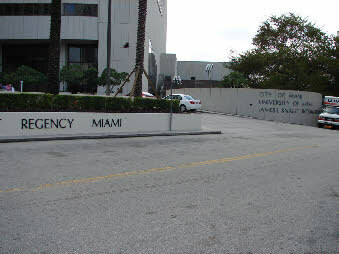 He went on the MiamiVice.org site several times and below is one posting he made that may be of interest to you. 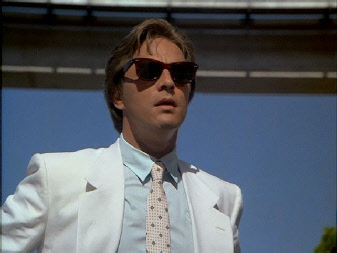 I was sent a link ( Miami Vice.org ) from a friend who, for want off anything better to do, did a search on my name. I went to the site and made a post clarifying a small but important point to me. When I returned a few weeks later I noticed a link to a site with some other ....... 'miss' info about that 'Mozambique' section. I thought I might contact you and give you the info scoop. 1. The 'Mozambique' was performed because of the " let's be certain he's dead" idea..... plus it was relatively unknown by the general audience at the time. 2. 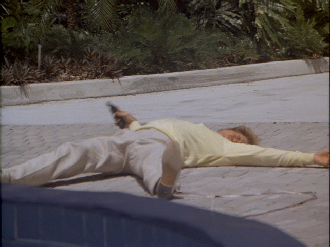 This episode transpired way before the DNA, forensic brilliance, etc. so the prints and DNA in the gloves where not relative at the time. 3. 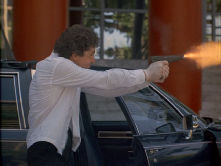 The unloading and dumping of the gun was to separate the character from the action. As soon as he walked away he could be just another employee. Unloading the gun first was to insure that no one picked it up and tried to use it on him as he walked away. Nothing was by accident. It all was thought out. If you watched an episode I did on Nash Bridges 15 years later I did exactly the same thing in the San Francisco airport. There is no truth to the robbery-jail time rumor. I have been told by a reliable source that the fellow who drove the get-a-way car did in fact end up in jail where-in he was killed. Not a pleasant story. Side bar...... Another reason this clip went into training programs around the country was because of a coincidental airing...... One Friday night in May we, the participants in the Bianchi Cup, where congregating in the bar of the Hilton hotel in Columbia, Mo. 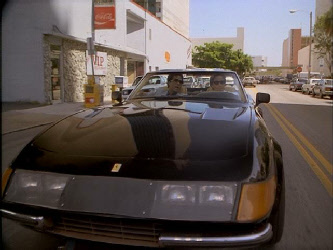 watching our favorite new show..... Miami Vice and .... you guessed it... "my" episode. What I remember through all the weird feelings I had during the airing was at the moment I put my hands into the 'surrender' position...... the entire room said "stand by.... ready..... It was a unique moment for me to say the absolute least. No camera tricks here, that quick draw and double tap was the real deal. 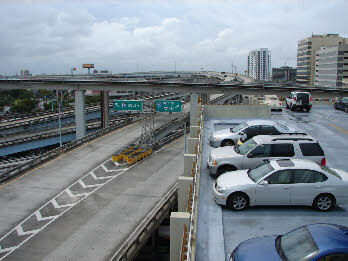 “Grey,83 Camaro, heading north on Brickell.” except they actually head south on Brickell and do a u-turn at the Rickenbacker Causeway in front of the Miami Seaquarium sign. 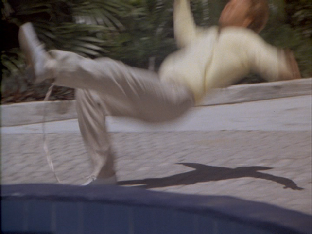 Filming goof: The wires for the squibs can clearly be seen as the actor falls dead. 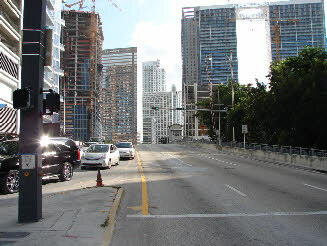 They then head northbound on Brickell back toward the Atlantis. 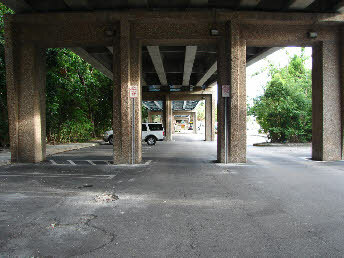 Then under the I95 entrance ramp. Then there is an interesting shot that I did not notice until October of 2007. In this short cut the image is reversed as was done a number of times in Vice. They are driving on the wrong side of the road. 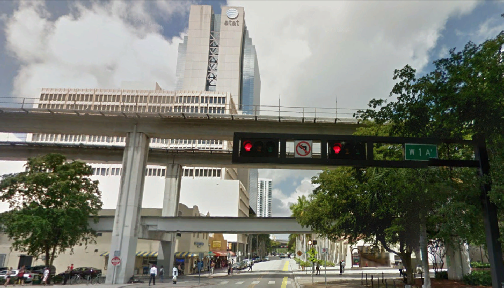 They are headed southbound on the northbound side of Brickell and are going under the I95 overpass entrance ramp. 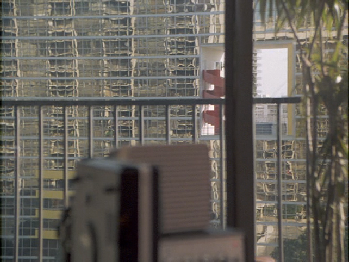 Then another scene that I realized in October 2007 was also a reversed image. 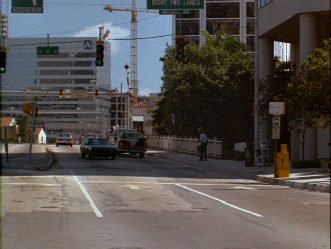 They drive by the International Tower better known as the Bank Of America building which was under construction at that time. As you look at the car the driver is on the left side. 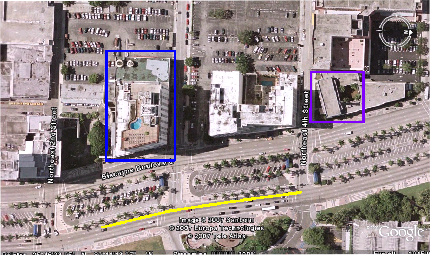 In the satellite picture above the area between the two yellow lines is what the camera captures. The point where the lines come together is where the camera was located. Tough spot to figure out due to the image being reversed. 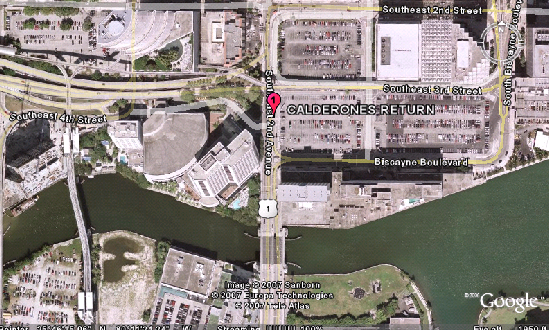 Then they come north over the Miami River on US1/SE 2nd Ave.
Then they turn into the Hyatt Regency Miami. 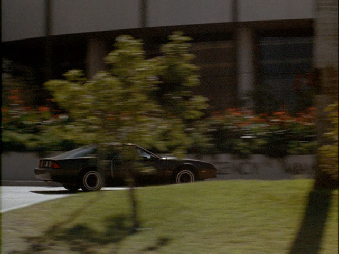 The police car pulls into the Hyatt and the bad guys drive by. 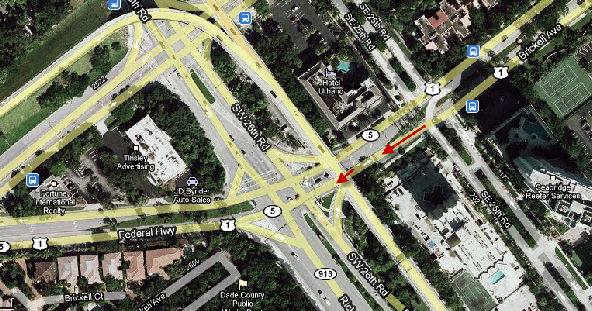 They are last seen going up the entrance to I95 past the Bank Of America Building. 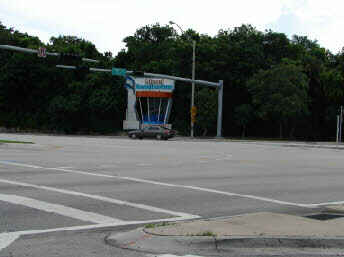 It then cuts to Tubbs driving northbound by the Everglades Hotel on US1/Biscayne Blvd. 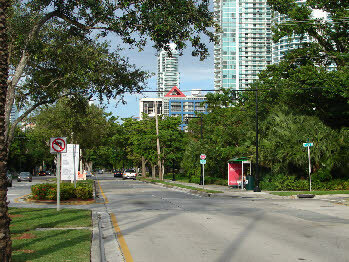 In the capture below right the Wolfson Campus of Miami Dade College can be seen in the background. 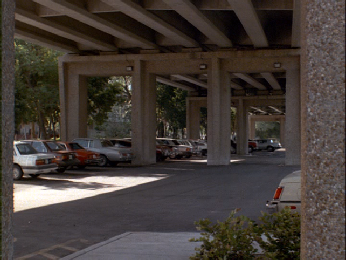 We will see this again in episode 19, The Home Invaders, where it is used as the exterior of the Police Station. 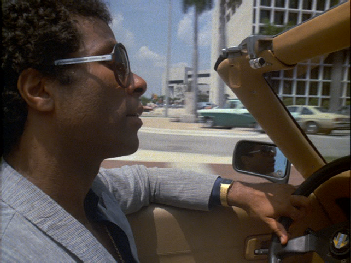 Tubbs is seen driving from NE 2nd St. to Ne 4th Street. 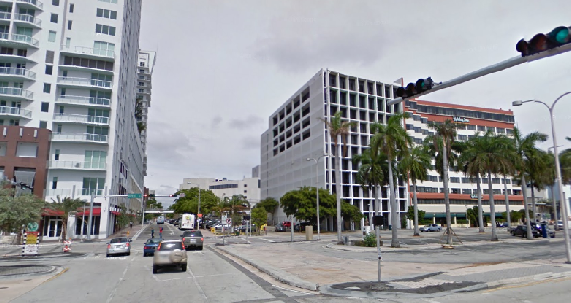 The Everglades Hotel has been replaced by a new high-rise condo building. 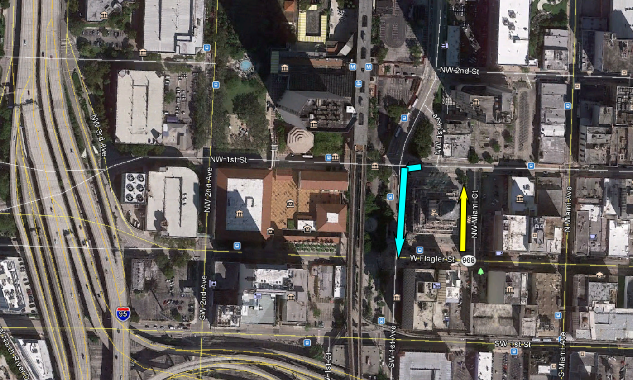 Yellow line is where Tubbs drives. 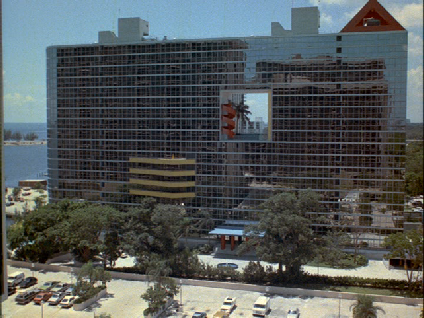 Building surrounded by blue outline is Everglades Hotel. 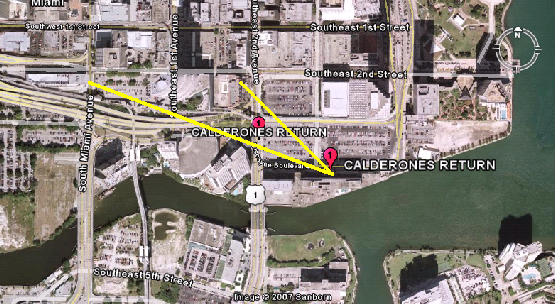 Purple outline surrounds church that we see at the end of this cut. 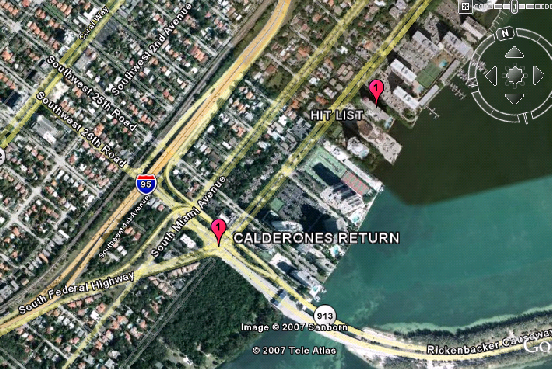 Hit List / Calderone’s Return. 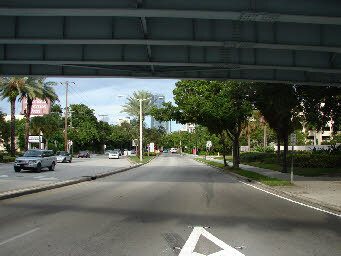 Then we see them round the corner from westbound on NW 1st Street to southbound on NW 1st Ave. 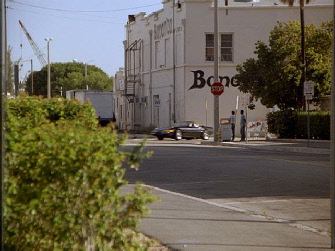 The Bonanza building seen in the background is now long gone. 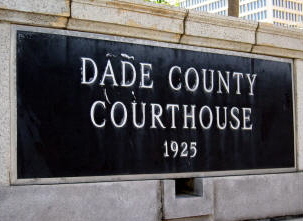 They stop at W. Flagler St. on the SW corner of the court house.